The following text was transcribed verbatim from the Air Ministry Meeting Minutes of Problems with Aircraft Production. These documents will shed some light on the ongoing discussion about the Typhoon four-bladed propeller and Tempest Tail. Unfortunately they do not provide the specific date when the first Typhoon was fitted with a four bladed propeller and Tempest tail plane entered service. I am sure the answer lies somewhere in the records of the Typhoon Squadrons or at Farnborough. Nevertheless, I do hope these documents will answer some questions that have been raised on HyperScale. 3. With regard to (b)*, I am completely at a loss to understand the statement about the TYPHOON on page 5 of the Report. I can only assume that the defects referred to are the troubles experienced with the tail unit of the aircraft and with the Sabre engine. Both these troubles were, however, experienced much earlier (May or June, 1943) and have been overcome. I cannot believe that work on either the TYPHOON or the Sabre engine at this time was allowed to suffer by the transfer of the draughtsmen to help in the development of post-war civil aircraft. I have been unable to obtain any confirmation of this in the M.A.P. (Ministry of Aircraft Production) and both D/C.R.D. and I doubt the accuracy of this statement. * refers to a previous minute that wasn't available. March 25, 1944 SECRETARY OF STATE. When I said in Minute 4 that the TYPHOON troubles had been overcome I referred, of course, to the major problems of the tail structure and the Sabre engine, and it was these problems to which, I believe, Prof. Appleton was referring. The difficulty due to oil leaks from the 4-bladed propeller is a very more recent trouble. 2. Perhaps it will be as well if I give you a brief history of the TYPHOON difficulties. The original aircraft fitted with a three bladed propeller presented two problems; the first was a serious vibration which was very difficult to eradicate, and the second was a failure in the air of a few aircraft, the cause of which could not be attributed to any particular defect. It was apparently due to the sum of several causes of which the vibration may have been one. Individually none of the defects would have caused failure. The failures were few in proportion to the total hours flown and, as the various possible causes were eliminated, the risk of failure became sufficiently remote to be an acceptable risk. Nevertheless, it is our endeavor to eradicate completely from British aircraft any weakness of this nature, however slight risk, and to this end the four bladed propeller and the TEMPEST tail were introduced. 3. When the four bladed propeller came into use it was found to leak oil (from the propeller and not from the engine) to an extent which may be unacceptable for operational use. We have, therefore. Been compelled to revert to the three bladed propeller until such time as we find a satisfactory remedy for the oil leak. 4. In reverting to the three bladed propeller it is necessary also to introduce a modification to the TEMPEST type tail plane in order to prevent recurrence of the vibration trouble. This involves fitting 10-lb., weights in the tail plane tips. 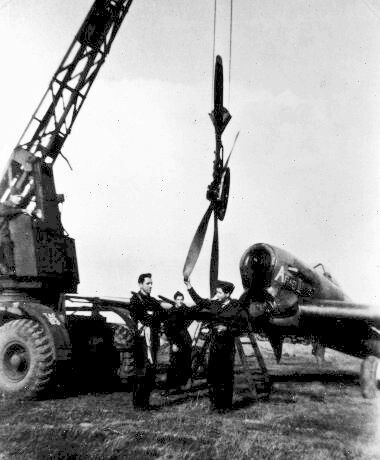 There are some 70 TYPHOONS in Maintenance Units with TEMPEST type tail planes which must be modified before the are issued to the Service, and it may be modified before they are issued to the Service, and it may be the hiatus that this will cause which gave rise to the report that the serviceability and operational strength of the TYPHOON Squadrons is seriously low. Special arrangements have been made to modify these aircraft; they are being done at the rate of ten a day and all seventy should be completed by the end of this week. The situation is, therefore, not serious. 5. With regard to curing the leaking oil trouble, the Americans experienced the same thing with their MUSTANG aircraft which have four bladed Hamilton propellers very similar to the four bladed De Havilland propellers on our TYPHOONS. The Americans found a satisfactory cure by fitting a special seal and we were able to obtain from them a small number of these seals, which we are now trying out for our four bladed TYPHOON propellers. It seems likely that they will be successful, but we are unable to obtain from the Americans in this country more than the small number required for trials, as they have only sufficient to meet their own needs. Arrangements have, therefore, been made to obtain a supply from America, but these will not be available in the country before May. Other arrangements have, therefore, been made to manufacture similar seals in the country and sufficient of these should be coming available in tow or three weeks' time to meet requirements of the De Havilland propeller assembly line. I have been unable to obtain any confirmation of the report that seals have been lost in transit. 6. The TYPHOON with the TEMPEST tail and four bladed propeller has been thoroughly tested and will be satisfactory when we have overcome the leaking oil trouble. We believe that the American pattern seal will cure this trouble and trials are in progress, but they have not yet done sufficient flying time for any more definite statement than this. Please let me know, when the trials of the four bladed propeller with the seals have been completed, wether it is satisfactory. At the same time, I should be grateful if you would confirm that the 70 Typhoons in Maintenance Units have been modified and delivered to the Command. I should also be grateful if you would tell me at the same time whether there is any, and if so what, difference between the performance of the Typhoon with the four bladed propeller and the Tempest tail and that of the old Typhoon with the three bladed propeller. The trials of the four bladed propeller with the seals have now been satisfactorily completed, but we shall not be completely satisfied until they have done intensive flying in the Service. The four bladed propellers fitted with the seals have already been despatched for fitting to aircraft on the Hawker production line and modified propellers will be sent for the Gloster production line early next week. The expected delivery of the modified propellers is 50 per week. Retrospective fitting to aircraft already produced will be arranged as soon as supplies of the propellers become surplus to production line commitments. 2. The number of Typhoon aircraft with Tempest tail plane and three bladed propellers which had been modified in Maintenance Units with the 10 lb., weight in the tail plane tips was 85 up to Saturday, 1st April 1944, and later arrivals are being modified at the rate of 7 a day. Modified aircraft are being delivered to the Command as required. 3. The only important difference in performance between the Typhoon with the four bladed propeller and the Tempest tail plane, and the old type with the three bladed propeller is that the four bladed propeller had improved take-off by reduction of some 150-200ft.